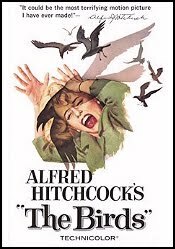 The Birds, directed by Alfred Hitchcock, follows the story of stylish blonde Melanie Daniels (Tippi Hendren) as she pursues a potential boyfriend to a small town in northern California. Events take a bizarre turn when birds of all kinds suddenly begin to attack people in increasing numbers and with increasing viciousness. Released in 1963, the film received scant attention from the critics, but it is one of Hitchcock's most psychologically complex works, a tense study of violence, loneliness, and complacency. Dennis Public Library features classic movies on the first Wednesday of every month.